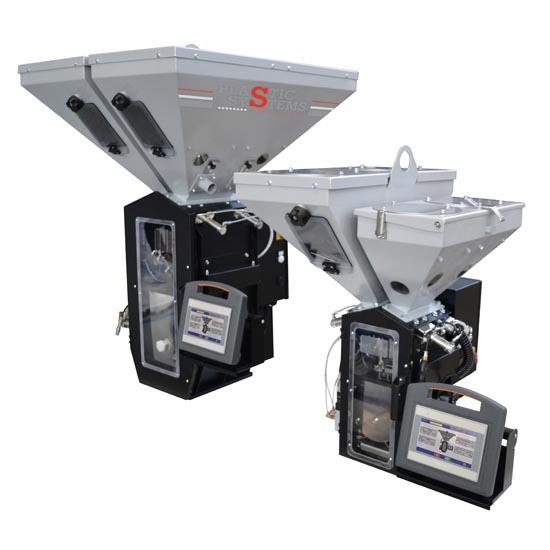 In many manufacturing processes of plastic materials, gravimetric blenders play a pivotal role: they weigh and adjust the exact percentage of each component flowing into the process. There are 3 base models in different configurations from 2 to 4 components. The operating cycle is completely automatic. The microprocessor control unit with a touch screen allows the operator to easily set the percentages of materials. This gravimetric blenders are easy to use and they can be installed to the floor or on a processing machine. Special pneumatic slide gates ensure a minimum dosing amounting to 0.5%. Each material is weighed inside the hopper. Once the set weight is reached, the batch flows into the mixer where all the materials are mixed altogether. • Two models covering throughputs from 20 to 720kg/h in different configurations ensuring up to 4 different materials. • Setup operations and reports can be downloaded onto USB devices. • Mixer equipped with load cells and a capacity of 4 batches. • When shocks or vibrations occur, load irregularities are detected and ignored. • Pneumatic slide gate under the mixer. • Stainless-steel hoppers with fast-opening slide gates (except for DGB140). • The load cells of the mixer are able to detect the material level or the throughput of the machine. • Colour touch screen operator interface. • Capacitive sensors for level control. • Automatic adjustment in case of variations in material density. • Direct settings of material percentages. • Mixers that ensure an accurate mixing action. Automatic compensation with material change. Direct configuration of component percentages. Precise and reliable control with an high precision of 0.1%. Mixers that ensure an accurate mixing action.